This article is about an organ. For Frank Zappa's song, see Duodenum (song). Schematic diagram of the gastrointestinal tract, highlighting the duodenum. The duodenum is the first section of the small intestine in most higher vertebrates, including mammals, reptiles, and birds. In fish, the divisions of the small intestine are not as clear, and the terms anterior intestine or proximal intestine may be used instead of duodenum. In mammals the duodenum may be the principal site for iron absorption. The duodenum precedes the jejunum and ileum and is the shortest part of the small intestine. In humans, the duodenum is a hollow jointed tube about 25–38 cm (10–15 inches) long connecting the stomach to the jejunum. It begins with the duodenal bulb and ends at the suspensory muscle of duodenum. It can be divided into four parts. The name duodenum (/ˌduːəˈdiːnəm, duˈɒdɪ-/) is from Medieval Latin, short for intestīnum duodēnum digitōrum, which may be translated: intestine of twelve finger-widths (in length), from Latin duodēnum, genitive pl. of duodēnī, twelve each, from duodecim, twelve. The Latin phrase intestīnum duodēnum digitōrum is thought to be a loan-translation from the Greek word dodekadaktylon (δωδεκαδάκτυλον), literally "twelve fingers long." The intestinal section was so called by Greek physician Herophilus (c.335–280 B.C.E.) for its length, about equal to the breadth of 12 fingers. The third part, or horizontal part or inferior part of the duodenum is 10~12 cm in length. It begins at the inferior duodenal flexure and passes transversely to the left, passing in front of the inferior vena cava, abdominal aorta and the vertebral column. The superior mesenteric artery and vein are anterior to the third part of duodenum. :274 This part may be compressed between the aorta and SMA causing superior mesenteric artery syndrome. The duodenum receives arterial blood from two different sources. The transition between these sources is important as it demarcates the foregut from the midgut. Proximal to the 2nd part of the duodenum (approximately at the major duodenal papilla – where the bile duct enters) the arterial supply is from the gastroduodenal artery and its branch the superior pancreaticoduodenal artery. Distal to this point (the midgut) the arterial supply is from the superior mesenteric artery (SMA), and its branch the inferior pancreaticoduodenal artery supplies the 3rd and 4th sections. The superior and inferior pancreaticoduodenal arteries (from the gastroduodenal artery and SMA respectively) form an anastomotic loop between the celiac trunk and the SMA; so there is potential for collateral circulation here. The venous drainage of the duodenum follows the arteries. Ultimately these veins drain into the portal system, either directly or indirectly through the splenic or superior mesenteric vein. The lymphatic vessels follow the arteries in a retrograde fashion. The anterior lymphatic vessels drain into the pancreatoduodenal lymph nodes located along the superior and inferior pancreatoduodenal arteries and then into the pyloric lymph nodes (along the gastroduodenal artery). The posterior lymphatic vessels pass posterior to the head of the pancreas and drain into the superior mesenteric lymph nodes. Efferent lymphatic vessels from the duodenal lymph nodes ultimately pass into the celiac lymph nodes. The duodenum is largely responsible for the breakdown of food in the small intestine, using enzymes. The duodenum also regulates the rate of emptying of the stomach via hormonal pathways. Secretin and cholecystokinin are released from cells in the duodenal epithelium in response to acidic and fatty stimuli present there when the pylorus opens and emits gastric chyme into the duodenum for further digestion. These cause the liver and gall bladder to release bile, and the pancreas to release bicarbonate and digestive enzymes such as trypsin, lipase and amylase into the duodenum as they are needed. The villi of the duodenum have a leafy-looking appearance, which is a histologically identifiable structure. Brunner's glands, which secrete mucus, are found in the duodenum only. The duodenum wall consists of a very thin layer of cells that form the muscularis mucosae. 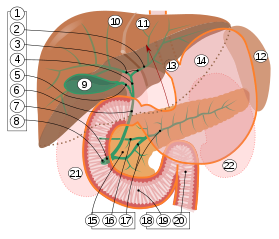 Diagram of the human duodenum with major anatomical locations labelled. About 20,000 protein coding genes are expressed in human cells and 70% of these genes are expressed in the normal duodenum. Some 300 of these genes are more specifically expressed in the duodenum with very few genes expressed only in the duodenum. The corresponding specific proteins are expressed in the duodenal mucosa and many of these are also expressed in the small intestine, such as ANPEP, a digestive enzyme, ACE an enzyme involved in control of blood pressure, and RBP2 a protein involved in the uptake of vitamin A.
Ulcers of the duodenum commonly occur because of infection by the bacteria Helicobacter pylori. These bacteria, through a number of mechanisms, erode the protective mucosa of the duodenum, predisposing it to damage from gastric acids. The first part of the duodenum is the most common location of ulcers as it is where the acidic chyme meets the duodenal mucosa before mixing with the alkaline secretions of the duodenum. Duodenal ulcers may cause recurrent abdominal pain and dyspepsia, and are often investigated using a urea breath test to test for the bacteria, and endoscopy to confirm ulceration and take a biopsy. If managed, these are often managed through antibiotics that aim to eradicate the bacteria, and PPIs and antacids to reduce the gastric acidity. The British Society of Gastroenterology (BSG) guidelines specify that a duodenal biopsy is required for the diagnosis of adult celiac disease. The biopsy is ideally performed at a moment when the patient is on a gluten-containing diet. Inflammation of the duodenum, known as duodenitis. Cancer of the duodenum, known as duodenal cancer. 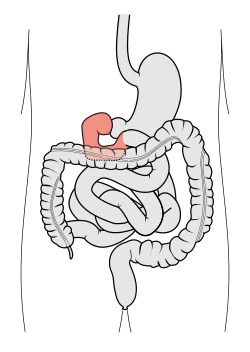 Wikimedia Commons has media related to Duodenum. Look up duodenum in Wiktionary, the free dictionary. ^ Guillaume, Jean; Praxis Publishing; Sadasivam Kaushik; Pierre Bergot; Robert Metailler (2001). Nutrition and Feeding of Fish and Crustaceans. Springer. p. 31. ISBN 978-1-85233-241-9. Retrieved 2009-01-09. ^ Latunde-Dada GO; Van der Westhuizen J; Vulpe CD; et al. (2002). "Molecular and functional roles of duodenal cytochrome B (Dcytb) in iron metabolism". Blood Cells Mol. Dis. 29 (3): 356–60. doi:10.1006/bcmd.2002.0574. PMID 12547225. ^ van Gijn J; Gijselhart JP (2011). "Treitz and his ligament". Ned. Tijdschr. Geneeskd. 155 (8): A2879. PMID 21557825. ^ "duodenum - Origin and meaning of duodenum by Online Etymology Dictionary". www.etymonline.com. ^ a b c d e f Drake, Richard L.; Vogl, Wayne; Tibbitts, Adam W.M. Mitchell; illustrations by Richard; Richardson, Paul (2005). Gray's anatomy for students. Philadelphia: Elsevier/Churchill Livingstone. ISBN 978-0-8089-2306-0. ^ Singh, Inderbir; GP Pal (2012). "13". Human Embryology (9 ed.). Delhi: Macmillan Publishers India. p. 163. ISBN 978-93-5059-122-2. ^ Deakin, Barbara Young ... [et al. ]; drawings by Philip J. (2006). Wheater's functional histology : a text and colour atlas (5th ed.). [Edinburgh? ]: Churchill Livingstone/Elsevier. ISBN 978-0-443-06850-8. ^ "The human proteome in duodenum - The Human Protein Atlas". www.proteinatlas.org. Retrieved 2017-09-26. ^ Smith, Margaret E. The Digestive System. ^ Britton, the editors Nicki R. Colledge, Brian R. Walker, Stuart H. Ralston; illustrated by Robert (2010). Davidson's principles and practice of medicine (21st ed.). Edinburgh: Churchill Livingstone/Elsevier. pp. 871–874. ISBN 978-0-7020-3085-7. ^ Ludvigsson, J. F.; Bai, J. C.; Biagi, F.; Card, T. R.; Ciacci, C.; Ciclitira, P. J.; Green, P. H. R.; Hadjivassiliou, M.; Holdoway, A.; van Heel, D. A.; Kaukinen, K.; Leffler, D. A.; Leonard, J. N.; Lundin, K. E. A.; McGough, N.; Davidson, M.; Murray, J. A.; Swift, G. L.; Walker, M. M.; Zingone, F.; Sanders, D. S. (2014). "Diagnosis and management of adult coeliac disease: Guidelines from the British Society of Gastroenterology". Gut. 63 (8): 1210–1228. doi:10.1136/gutjnl-2013-306578. ISSN 0017-5749. PMC 4112432. PMID 24917550.